Course, Range, and Practice Areas open daily from 6 a.m. - 10 p.m. Range opens at 12 p.m. every Tuesday and the last bucket is sold at 9:00pm and lights go off at 10:00pm. Miscellaneous Rates: Chipping tube $9; Extra person chipping tube $3; Chipping tube and large grass $17; $50 = $60 on key; $100 = $125 on key; $250 = $350 on key. Tee times may be made up to 7 days in advance. When you call to make your reservation, our staff will ask the number of players in your group and the day and time you would like to play. We will do our best to accommodate you. We will require a phone number to reserve the time. ID required to rent a golf club, soccer ball, or disc. ID returned when rented equipment is returned. All rentals must be returned to the Pro Shop 30 minutes prior to closing. Designed by Michael Orren in 1991, Lake Forest Golf and Practice Center is situated among orange groves, beside Aliso Creek, and just west of the Saddle Back Mountains in Lake Forest, California. Our par 29 9-hole course features numerous mature trees, soft sand bunkers, and two on-course lakes. Conveniently located where the 5 and 405 freeways meet in southern Orange County, our easily walkable course layout offers a perfect introduction to the game for beginning golfers and juniors, while still delivering a challenge to the seasoned player. Our signature second hole is a 115-yard par 3, which plays over a lake to a green surrounded by mature sycamores with the creek wrapping round it. Additionally, true to its name, Lake Forest Golf and Practice Center has one of the best driving range and practice facilities in the area. The range is equipped with two tiers of matted stalls, 60 in total, as well as a natural turf hitting area open year round. When you purchase an e-range key, we offer discounts of up to 35% off the regular cost of balls. For fine-tuning and short game practice, Lake Forest Golf and Practice Center also provides a large, 9-hole putting green and five-bunker chipping area. 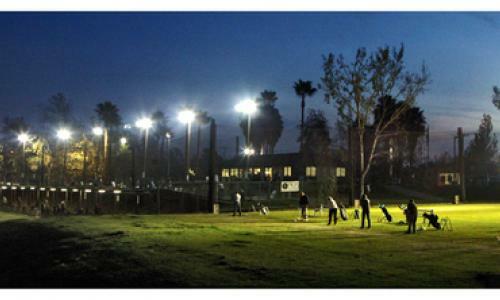 Both the golf course and practice areas are night lit until 10:00 p.m. for convenient after work and evening play.